Movie: "Johnny English Strikes Again"
Johnny English is called out of retirement when MI-7 is hit by a cyber-attack that compromises the identity of all of their active agents. English must find this hacker and put a stop to their attacks. Sometimes you have to wonder if the filmmakers in the "Johnny English" series have waited so long between the sequels so they can just keep repeating the same basic plot over and over again and act like it's something new. "Johnny English Strikes Again" is directed by David Kerr. This is his first theatrically released feature film, though he has directed numerous episodes of various television series and made-for-TV movies. 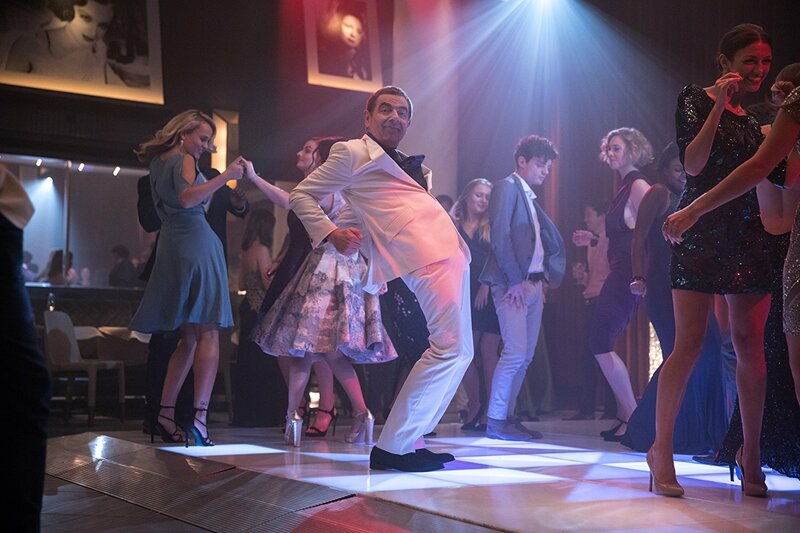 The screenplay is written by William Davies, who has been a writer on both "Johnny English" and "Johnny English Reborn." 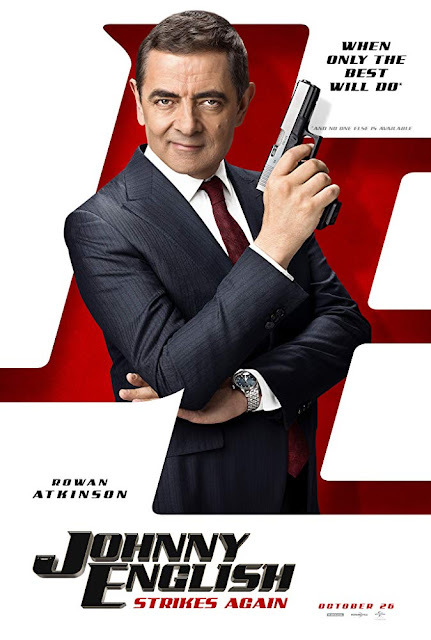 Johnny English (Rowan Atkinson) has retired from MI-7 and has been working as a teacher, but when MI-7 is hit with a series of cyber-attacks that compromise the identity of all their active agents, English is called out of retirement to find out who is behind these continued attacks on England and their infrastructure. Writer William Davies has a formula for this spy spoof series, and he certainly sticks to it. We literally could have copy/pasted our review for either "Johnny English" or "Johnny English Reborn" and merely changed the title of the movie, that's how identical the plot points are and how similar our thoughts for "Johnny English Strikes Again" are. 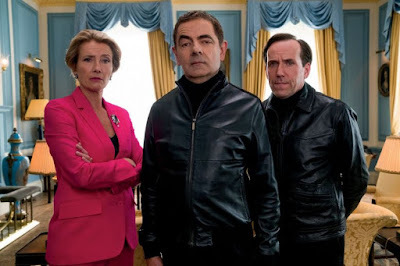 Each time around, Davies has to make sure that Johnny English is brought into MI-7 as a last resort, must put him under a commanding officer (Ema Thompson this time around) who hates him and doesn't trust his abilities, has to give him a more capable sidekick that English looks down upon (Ben Miller back as Bough), and must find a way to get English fired before he gets to save the day. Also, each villain must be a secret to the audience...only not really because it is always obvious who the baddie is the second they appear on the screen. These are the basic plot points of the first two films, and that doesn't change in here. Another thing that hasn't changed over time is the comedic ability of Rowan Atkinson. As always, Atkinson has the ability to combine his signature slapstick buffoonery with expert skill, sharp delivery, and just a touch of douchebaggery. We, and the entire audience of out 1:50pm screening, wound up laughing a lot throughout this movie, maybe more than we would care to admit. We don't watch spy spoofs like this for turn-of-the-century plots or complex narratives, we watch them because they are funny, and this movie certainly is that. 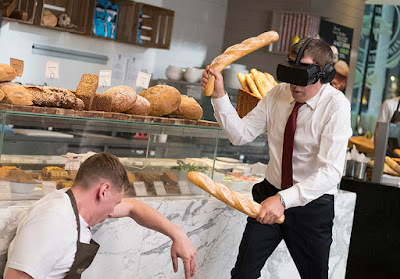 In the end, "Johnny English Strikes Again" will provide you with a dumb-but-fun viewing experience, provided you like clueless fogeys who refuse to use technology, talk with offensively over-the-top French accents, give weapons to kids, fight people in what they think is a simulation with sourdough baguettes, and curse their sidekicks at every turn. We laughed enough to the point where we can overlook its other faults, though we totally understand if you disagree.